Home > Beaded Curtains & Columns > Crystal Ceiling Drapes > COMING SOON! 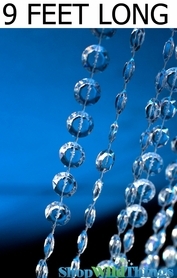 Diamonds Non-Iridescent LED Ceiling Drape & Canopy - Warm White - 15 Feet Long - PREMIUM QUALITY BEADS! 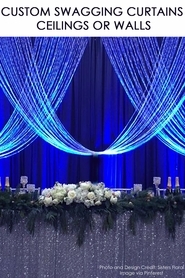 Our Diamonds LED ceiling drape and canopy from ShopWildThings is 15 feet long and 20 inches wide. 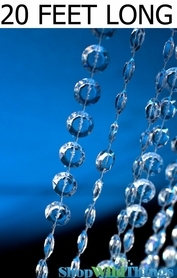 Crystal clear diamond-shaped beads by the thousands are combined with five strands of warm white LED fairy lights per strand. The faceted cut will reflect lights from every angle. Two people are needed to install on the ceiling or as a wall backdrop using the four attachment rods with four attach points. 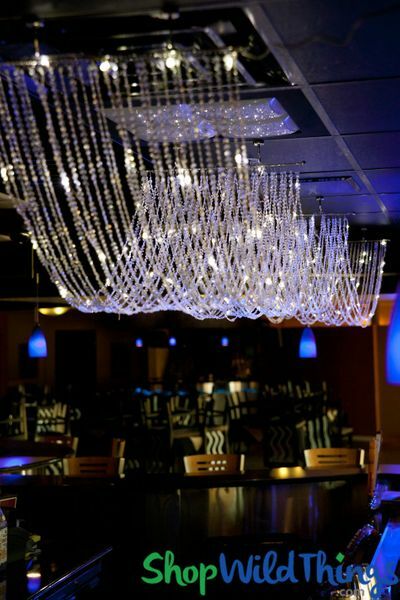 Create a canopy or gazebo effect by hanging part of this lighted crystal ceiling drape on the ceiling and letting part dangle to the floor. This ceiling curtain has 30 strands of beads with five strands containing LED lights on silver wire. 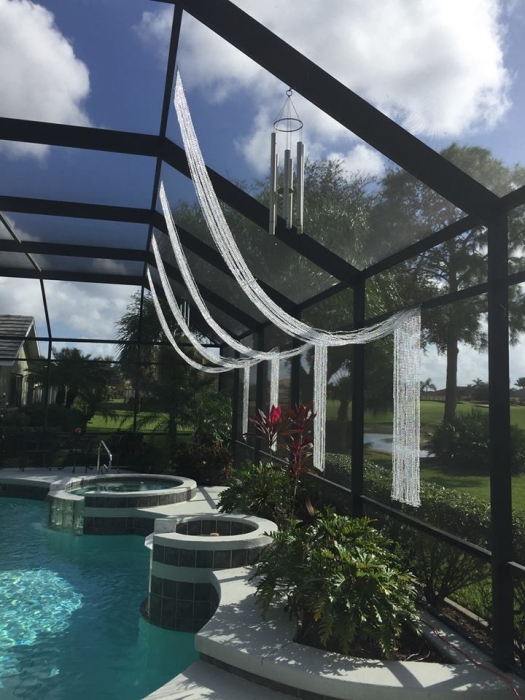 One end of the crystal acrylic bead drape has a plug-in transformer and 50 inches of electrical cord. We love that LED lights are Earth-friendly and cool to the touch. 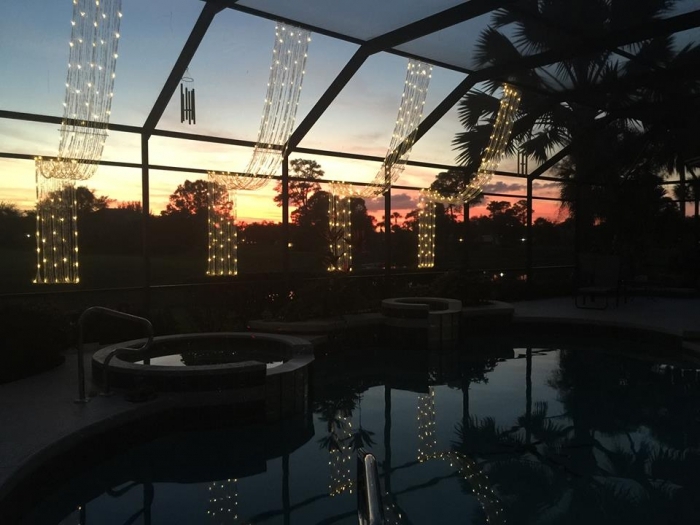 We draped four of the Ceiling Drape & Canopy lights on the back of our lanai. We draped from the ceiling the first 10' to the back wall, then the remaining 5' hung down the back. It was MAGICAL and absolutely WOW'd everyone! Our Christmas Party was AWESOME with over 100 people enjoying the effect of the lights. But the New Year's Eve WEDDING RECEPTION was MAGICAL and beyond imagination with the crystal curtains adding so much to the evening! Would love to keep it up year round, but I'm afraid the Florida sun would yellow the crystals. AND, the LEDs are clearly not made for outside use. ProsGORGEOUS! Not too difficult to hang, but had to hire a professional because of the pool and lanai. Can I give a 5+ star rating? These are spectacular! 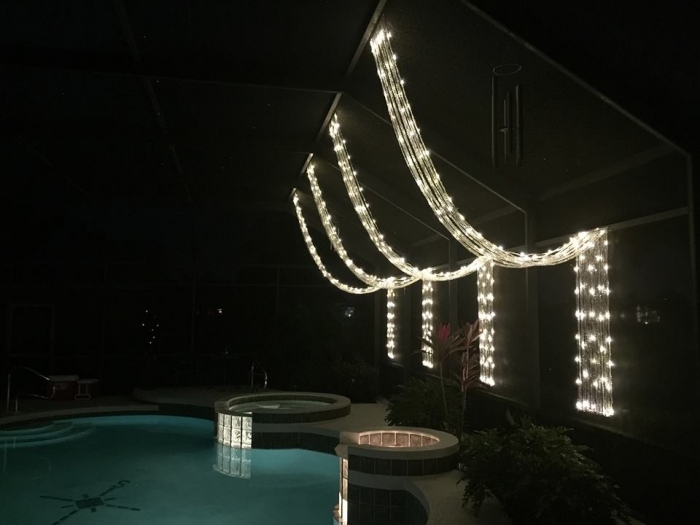 Hung them from the ceiling at my daughter's wedding reception to make a false ceiling and used 3' extension cords to connect them together. It helped make the venue look like a fairy land! LOVE these! Merchant Response:Wow! We are so excited that you loved them. We'd love to see photos! Congratulations to you and your daughter! I was absolutely happy with my purchase. The bars can be rearrange to give the shape that you want. I'm planing to use it for a suspended gazebo and its perfect. Exactly what I wanted. Not quite as wide as it appears in the photo but it's just right. Fast shipping! Easy to hang too. Exactly as described. Well packed for shipping. Very pretty. I have these in my shop and they are beautiful! I put them up a week ago and everyone who walks in loves them! I will be getting more! Just as it was described, just loved it. Proswould purchase from this supplier again. Made our barn wedding complete! awesome! be careful with handling, canopy can get tangled, but easy to hang with two people!